Many modern housewives have microwaves in their kitchen. They excellently cope with heating the food taken out from the refrigerator, with defrosting food from the freezer, they can quickly prepare delicious and healthy dishes. However, they need proper care, as well as all domestic kitchen appliances. 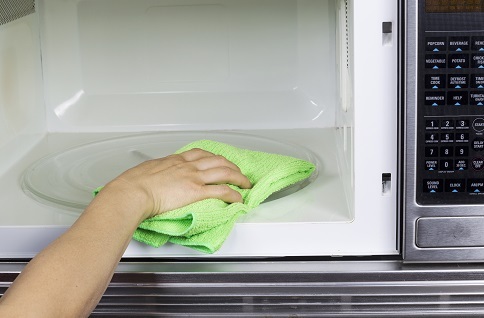 How can we quickly and easily clean the microwave will be discussed in our article. Many ready-made meals splatter during heating, and during the preparation of various dishes the inner surface of the microwave oven usually becomes very dirty. Many of us do not like to clean the microwave, as it is not very convenient, and many are simply afraid to damage it. If you do not clean the inner surface of the oven immediately, then the dirt dries up and cleaning it becomes much more difficult. Using acid and a variety of abrasive products, when cleaning, is dangerous, as they can damage the inner coating. Ordinary baking soda will help us to cope with this problem. Put a large bowl with water into a microwave and turn on the household appliance at full capacity, setting the time interval for 10 minutes. Then take a sponge, put on it a little bit of soda and rub the contaminated spots. After this wipe the walls with a damp cloth. Soda perfectly copes with old contaminations. For example, by using soda you can easily clean the iron soleplate or wash ceramic cookware. The microwave can also be quickly and easily cleaned with the help of a lemon. For this method pour two cups of water into a glass bowl, and put there some cut lemon. The microwave then should be turned on at full capacity for 15 minutes. All you need to do afterwards is to remove the bowl from the microwave and wipe its walls with a clean, damp cloth. Vodka can also handle some contaminations. It is necessary to take a soft cloth, moisten it in alcoholic beverage and wipe the walls inside the household appliance. Vodka can be left without washing off with clean water, since alcohol vapors evaporate themselves. Alcohol solutions are also applicable in cleaning the tiles. – Those food products that can spatter during heating or cooking should be covered. – You can buy a special cover for the microwave, it much easier to wash it than the appliance itself, moreover, it prevents the products from drying. – To prevent an explosion, some products need to be poked through (this applies to products with the skins). And remember, only proper use and timely cleaning of the appliance will help the microwave to serve for the longest time.